Merry-Go-Round, a Norman Rockwell painting, appeared on the cover of The Saturday Evening Post published May 3, 1947. This is another favorite of Rockwell collectors, a classic enduring image of the world Rockwell painted. An alternate title for this painting is Circus Artist. This painting was Rockwell's 246th overall out of 322 total paintings that were published on the cover of the Saturday Evening Post. Rockwell's career with the Post spanned 47 years, from his first cover illustration, Boy With Baby Carriage in 1916 to his last, Portrait of John F. Kennedy, in 1963. This was also the third cover for The Post in 1947. In 1947, there were seven Norman Rockwell Saturday Evening Post covers published. on page 174 of Norman Rockwell, A Definitive Catalogue by Laurie Norton Moffatt. 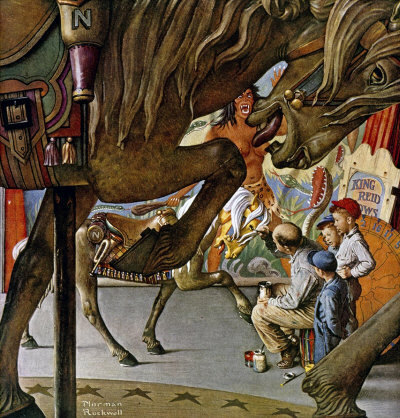 In this painting, Norman Rockwell give us a glimpse into the fascinating world of the carousel. The intricately carved and brightly painted figures on the carousel no doubt made Rockwell eager to capture them on canvas. Rockwell delighted in painting detail. This painting gave hime lots to delight in. There are so many layers to this painting. In the foreground, we get to see a closeup of one of the wooden horses. He looks fearsome, doesn't he. The horse in the foreground is almost a match for the horse that the painter is touching up with paint. The only difference is the pose of one of the front legs. Rockwell has captures every detail on the horses, from the mane to the feathers, the hair around the hoof. He also captures the detail of the saddle. You can even make out the shape of the imaginary horse shoe on the hoof of the horse. Merry-Go-Round was only one of 322 Norman Rockwell Saturday Evening Post covers; Here is the list of Norman Rockwell Saturday Evening Post cover illustrations. Judging by their expressions, the three boys are really enjoying watching the artist retouching the paint on the hobby horse. He appears to be so immersed in his work that he doesn't even notice his audience. The boys do not even seem bothered by the spectacle in the far background. A savage with sharp teeth and nails is fighting off a carnivorous plant with a club. No doubt their next ride on the Merry-Go-Round will be even more special since they witnessed its repair. Do You Have A Great Story, Opinion Or Contribution About Merry-Go-Round?